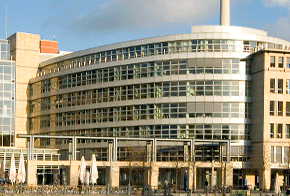 Located in the old city center of Berlin, next to Museums Island, Berlin Dome or few hundred meters from Alexanderplatz and Television Tower, Fraunhofer Forum is one of the modern buildings in the area designed to host conferences and conventions. The main entry in the building is from the Spree river side (a walking promenade), with secondary entry from Anna Louisa Karsch street, both of them can be use to enter. As reference, on the river side, at the corner of the building, is located Allegretto coffee shop. The conference room is named Spektrum and is located on the ground floor, just behind the information desk – practically after entering the building and walking a bit, Kamailio World area should be easy to spot. There are many hotels in the area, situated in walking distance range. However, Berlin is well known for its excellent public transport, so you can choose the best accommodation option in the city that fits your requirements. Next is a list of hotels that could make the decision easier for participants. The website for the public transport company in Berlin is available here.